Original, quality heavy moulded glass electric light fitting with the original chromed shade holder with hook. 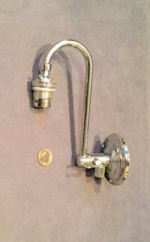 This chromed fitting is impressed "patented 1923" and all was manufacturer by "Jeffersons" of Canada for the UK market. 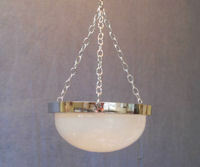 A length of new chromed chain and a new replacement chromed ceiling rose is included. Has been rewired with modern three core silk covered flex and a new chromed UK bulb holder. Polished and lacquered, although the lacquer may be removed at no extra cost and complete and in good and working order. 15" tall plus 16" chain plus 2.5" ceiling rose + 3.5" diam. Shade 12.5" diam. 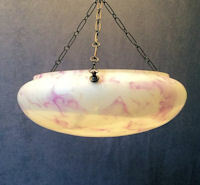 Original, quality 1930's larger than average hanging marbled glass light bowl with the original oxidised fittings and chains and a replacement three hook ceiling rose of a similar colour. The bowl has purple and white marbling on a clear glass background. 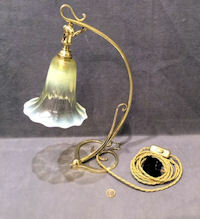 A rewired brass bulb holder of a similar colour is included and all has been fully overhauled and is complete and in good and working order. 15" drop including chains, 1" rose x 2.75" diam and 16" widest. 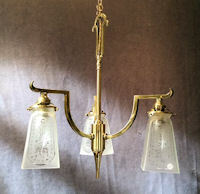 Original, quality pair of 1920's three branch cast brass hanging electric light fittings. Have been rewired with modern three core silk covered flex and new brass UK bulb holders. Replacement card candle look-a-likes have been fitted to cover the bulb holders and a length of new brass chain and a new replacement brass ceiling rose is included for each light fitting. Fully overhauled, polished and lacquered, although the lacquer may be removed at no extra cost and complete and in good and working order. 18.5" tall + 16" chain + 2.75" rose x 3.5" diam. 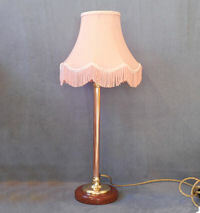 Original, quality 1920's decorative opaline coloured glass, very frilly continental gas lamp shade with a brass shade holder decorated with engraved acanthus leaves to fit a standard, modern, UK electric bulb holder. This fitting has been wired with modern three core flex, and a new brass UK bulb holder. 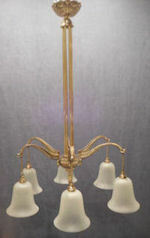 A length of new brass chain and a new replacement brass ceiling rose is included. Fully overhauled with the brass polished and lacquered, although the lacquer may be removed at no extra cost and all is complete and in good and working order. Shade 10" diam + 7" tall including holder. Chain 15" long + ceiling rose 1.75" tall x 2.5" diam. 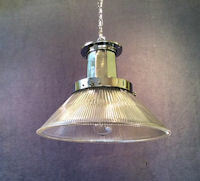 Original, quality multifaceted moulded glass 'Holophane' electric light fitting. This superb light, patented in 1909, has the original brass shade holder and has been rewired with modern three core silk covered flex and a new brass UK bulb holder. 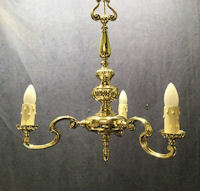 A length of new brass chain and a new replacement brass ceiling rose is included. Fully overhauled, polished and lacquered, although the lacquer may be removed at no extra cost and complete and in good and working order. 10" tall including holder + 16" chain + 6" diam and 2" rose x 2.5" diam. Price is for each. 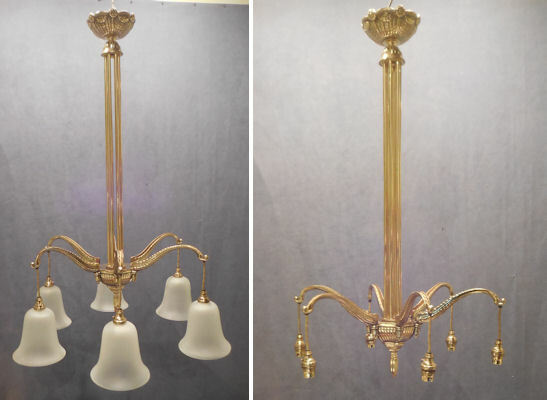 Original, quality 1920's cast brass three branch electric light fitting with the original cast brass ceiling rose and a length of replacement brass chain. This super example has three upturned arms with replacement card candle look-a-likes fitted to cover the bulb holders. Rewired with modern three core silk covered flex and new brass UK bulb holders. Fully overhauled, polished and lacquered, although the lacquer may be removed at no extra cost and complete and in good and working order. 21" tall + 25" chain and 3" rose x 4" diam. 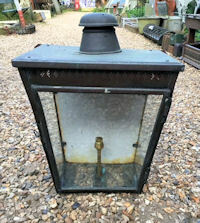 Original, quality 1920's cylindrical shaped electric hall lantern with a one piece frosted glass liner and a pierced brass frame with a dome top. Has been rewired with modern three core silk covered flex and a new brass UK bulb holder. A length of replacement brass chain and the original brass ceiling rose is included. Fully overhauled, polished and lacquered, although the lacquer may be removed at no extra cost. Some minor scratches to the glass, otherwise all is complete and in good and working order. 15" tall x 8.5" diam. Chain 13", rose 3.75" + 2" tall. Original, quality 1920's plain three branch brass electric light fitting of a simple design with a waisted centre stem and a ring to the top. Has been rewired with modern three core silk covered flex and new brass UK bulb holders. A length of replacement brass chain and a new brass ceiling rose is included. Fully overhauled, polished and lacquered, although the lacquer may be removed at no extra cost and complete and in good and working order. 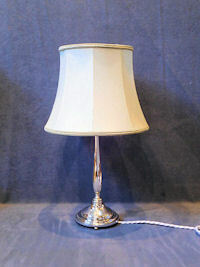 The shades are not included in the price, but may be available; see our "Lamp Shades" section, item code: S233. 10" tall excluding shades + 14" diam. 13" chain and 2" rose x 2.5" diam. 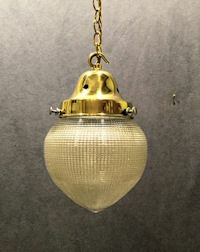 Original, quality 1920's hanging electric light fitting of a most unusual design. 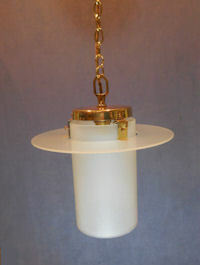 This example has a cylindrical shaped glass shade with the three original brass hooks and replacement brass chains, ceiling rose and wired blub holder. 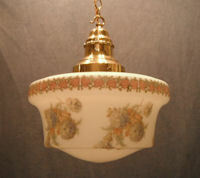 The glass shade has a background of yellow, decorated in Art Nouveau designs in colour of laurel leaf swags and roses. 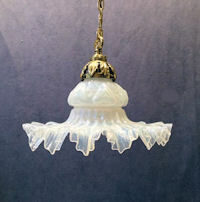 The underside has a yellow finished glass finial surrounded with a paisley type pattern. The brass has been polished and lacquered, although the lacquer may be removed at no extra cost. Fully overhauled and complete and in good and working order. Glass 10" tall x 8" diam. Chain as in picture 11" and total height 21". Ceiling rose 2" x 3.25" diam. 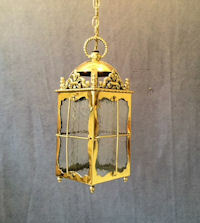 Original, quality 1920's small brass electric hall lantern in the style of a period lantern clock. This example has been fitted with replacement textured glass panels, has been rewired with modern three core silk covered flex and a new brass UK bulb holder and fully overhauled. 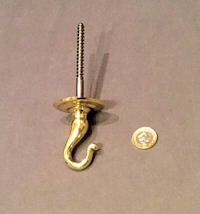 New brass replacement ceiling rose and length of brass chain is included. All has been polished and lacquered, although the lacquer may be removed at no extra cost and is complete and in good and working order. Total 13" tall and 5.5" square. 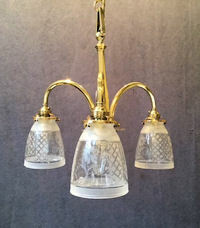 Original, quality pineapple shaped multifaceated clear glass light fitting with a brass shade holder, a length of new brass chain and ceiling rose, rewired with modern three core silk covered flex and a new brass UK bulb holder. Fully overhauled, some surface chips / blemishes to the shade but still in good order otherwise. The rim of the shade is marked "Patented 1909" and "Holophane" for the maker and the brass shade holder is also stamped "Holophane". All has been polished and lacquered, although the lacquer may be removed at no extra cost and is complete and in good and working order. Shade and holder 9.5" tall plus 15.5" chain. Glass 6" diam and 2" rose x 2.5" diam. 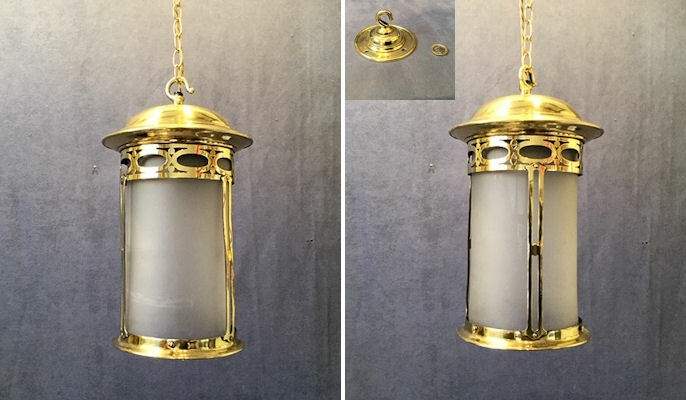 Original, quality pair of circa 1910's / 1920's moulded opaline glass lamp shades with cast brass shade holders, new brass chain and old brass ceiling roses. Have been rewired with modern three core silk covered flex and new brass UK bulb holders. 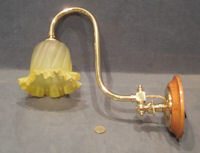 This pair of lights were manufactured by Jefferson's of Canada for the UK Market. The brass has been polished and lacquered, although the lacquer may be removed at no extra cost. Fully overhauled and complete and in good and working order. 11.75" diam x 8.5" + chain 16.5" and rose 3" x 4.75". 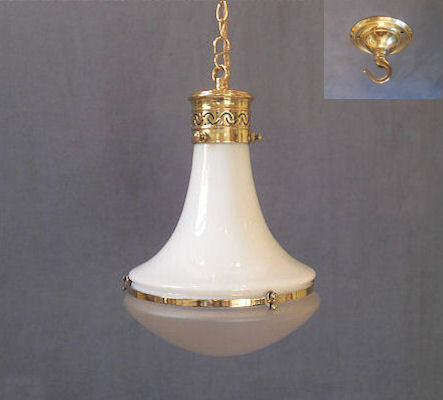 Original, quality 1920's circular white glass light bowl embossed with a decorative melon shaped design in the original circular brass ring frame and replacement brass chains and ceiling rose. 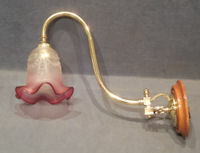 A new brass bulb holder is included, wired with new silk covered, three core flex. Fully overhauled and all is complete and in good and working order with the brass polished and lacquered, although the lacquer may be removed at no extra cost. Bowl and frame 13" diam. Total depth as in picture 20". Ceiling rose 3.25" diam and 1.75" tall. 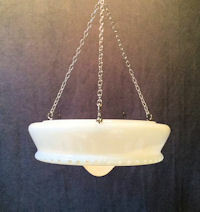 Original, quality 1930's / 40's circular hanging white overlaid on clear glass electric light shade with replacement chromed chains and rose and a new chromed bulb holder, wired with new silk covered, three core flex. Fully overhauled and complete and in good and working order. 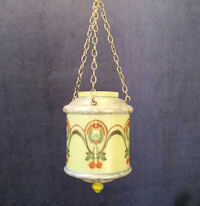 A most unusual hanging light unit with cut decoration. Bowl 15.5" diam and 7" deep. Max drop as in picture 21". Ceiling rose 2.75" diam and 1.75" tall. 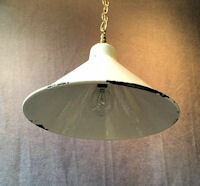 Original, quality 1920's / 30's white enamelled coolie hat shaped light shade, with the original brass fitting, a replacement brass hook, ceiling rose and length of chain. Has been rewired with modern three core silk covered flex and a new brass UK bulb holder. Minor chip to the lower rim (see picture), otherwise all is complete and in super condition, fully overhauled and complete and in good and workinh order. The brass fittings have been polished and lacquered, although the lacquer may be removed at no extra cost. 13.25" diam x 10" tall including hook plus chain 13", rose 2"tall and 2.5" diam. Other matching fitting and shadeS may well be available ref codes HL436 and HL437. 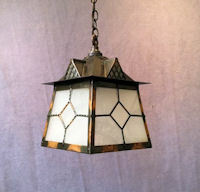 Original, quality 1920's hexagonal shaped frosted glass electric hall lantern with designs of temple ruins painted to the inner walls. This example has the original brass shade holder, replacement three core silk covered flex and brass bulb holder and ceiling rose, both fitted with olive grips. The brass has been polished and lacquered, although the lacquer may be removed at extra cost. Fully overhauled, and complete and in good and working order. Shade 8.5" tall x 7.5" widest. 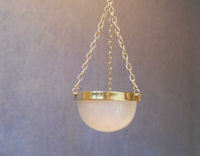 Original, quality 1920's pendant electric light fitting with an off white shaped globe with a brass shade holder. Has been rewired with modern three core silk covered flex and a new brass UK bulb holder. 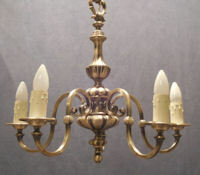 A length of new brass chain and a new replacement brass ceiling rose is included. Fully overhauled and the brass polished and lacquered, although the lacquer may be removed at no extra cost. Complete and in good and working order. Light fitting 11" tall and chain 15". Diam light fitting 8" + ceiling rose 1.75" and 2.75" diam. 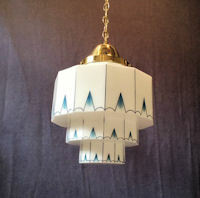 Original, quality 1920's / 30's white enamelled coolie hat shaped light shade, with the original brass fitting, a replacement brass hook, ceiling rose and length of chain. Has been rewired with modern three core silk covered flex and a new brass UK bulb holder. Chips to the upper and lower rim (see picture), otherwise all is complete and in super condition and fully overhauled. The brass fittings have been polished and lacquered, although the lacquer may be removed at no extra cost. 13.25" diam x 10" tall including hook plus chain 13", rose 2"tall and 2.5" diam. Other matching fitting and shades may well be available ref codes HL436 and HL444. 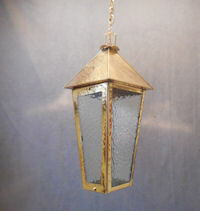 Original, quality 1920's / 30's electric hall lantern in the original oxidised finish, with the original frosted glass panels and oxidised chain and a replacement ceiling rose in the same colour. 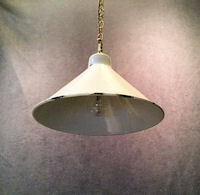 This unusual light fitting has been rewired with modern three core silk covered flex and a new brass UK bulb holder. Fully overhauled and complete and in good and working order. Lamp 9.5" tall plus 13" chain. Base and hood 6.5" square plus ceiling rose 2.25" tall x 2.5" diam. 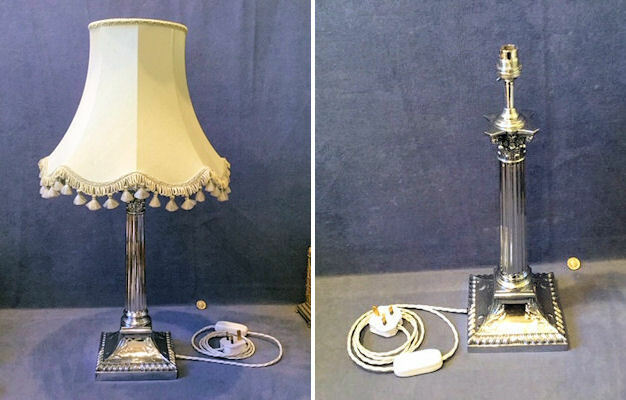 Original, quality 1920's multifaceted clear moulded glass light shade fitted, with a chromed shade holder and fitting of a similar age but not original to each other. The chrome fitting has been adapted using two aluminium plates made to suit. All has been polished, rewired with modern three core silk covered flex and a new chromed UK bulb holder and fully overhauled. A length of new chrome chain and a new chrome ceiling rose are included and all is complete and in good and working order. Shade 11.5" diam, shade and holder 10" tall plus 20" chain, rose 2" tall and 2.5" diam. Price is for each. 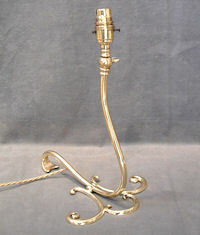 Original, quality 1920's three branch brass electric light fitting of an unusual design. The simple central column has three square tubed brass arms curving up with down lighting bulb holders. The original brass ceiling rose is included as is a length of new brass chain. Has been rewired with modern three core silk covered flex and new brass UK bulb holders. Fully overhauled, polished and lacquered, although the lacquer may be removed at no extra cost. Complete and in good and working order. The shades are not included in the price, but may be available; see our "Lamp Shades" section, item code: S957. Total drop excluding shade 18", 14" wide plus chain and ceiling rose 2" tall and 3" diam. Original, quality 1920's three branch brass electric light fitting with a six sided shaped central stem with three matching arms rising up and over with downward facing bulb holders. A length of replacement brass chain is included as is the original brass ceiling rose. Has been rewired with modern three core silk covered flex and new brass UK bulb holders. The shades are not included in the price, but may be available; see our "Lamp Shades" section, item code S37. Fully overhauled, polished and lacquered, although the lacquer may be removed at no extra and all is complete and in good and working order. 14" tall and 14" diam excluding shades. Chain 20", ceiling rose 3.5" diam and 3" tall. 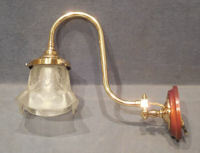 Original, quality late 19th century, brass pendant gas light fitting converted to electricity with a new brass bulb holder to fit a standard UK Bayonet cap light bulb. 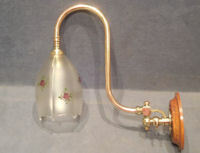 The gas tap, as seen, is now fixed to permit the electric conversion and the shade is not included in the price, but may be available; see our "Lamp Shades" section, item code S83. All has been fully overhauled, polished and lacquered, although the lacquer may be removed at no extra cost. Complete and in good and working order. Excluding shade 35" long, 3" widest and 3" rose diameter. 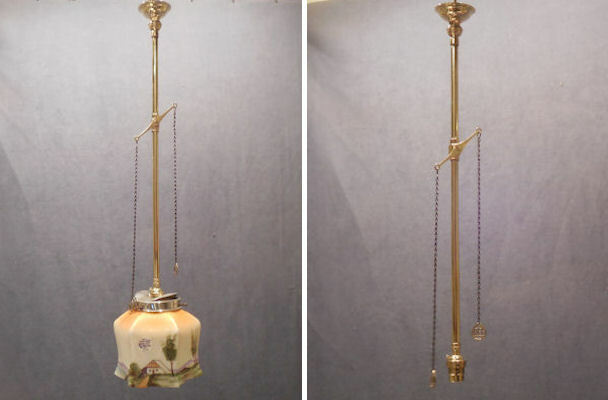 Original, quality 1920's pendant light fitting with a large stepped white glass shade/globe with the original brass shade holder and rose and a length of replacement brass chain. This example has been rewired with modern three core silk covered flex and a new brass UK bulb holder. Has been fully overhauled, polished and lacquered, although the lacquer may be removed at no extra cost. The globe is decorated in an Art Deco feel with blue detail, and the top shoulder is transfer printed "Supastone made in Czechoslovakia". One very minor chip more a flake otherwise all is complete and in good and working order. 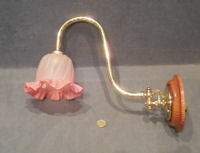 Shade with holder and hook 16" tall x 12" widest, plus chain 20", rose 3" tall and 4" diam. Original, quality 1920's five branch electric light fitting in the original anodised on brass 'nickel' colour with a length of old matching chain and the original ceiling rose. Has been rewired with modern three core silk covered flex and new brass UK bulb holders. Replacement card candle look-a-likes have been fitted to cover the bulb holders. The anodised finish has a two tone effect. Has been fully overhauled and is complete and in good and working order. A good fitting of a good weight. 18" drop plus chain and rose 3", 21" diam total and rose diam 4". Original, quality 1920's heavy five branch electric light fitting in the original oxidised on brass "bronze" finish with the original matching ceiling rose and short length of heavy chain. Has been rewired with modern three core silk covered flex and new brass UK bulb holders. Replacement card candle look-a-likes have been fitted to cover the bulb holders, all has been fully overhauled and is complete and in good and working order. A larger than average light fitting and of heavier quality. 22.5" drop plus chain 7" and rose 2.5", 27" diam and rose diam 4". 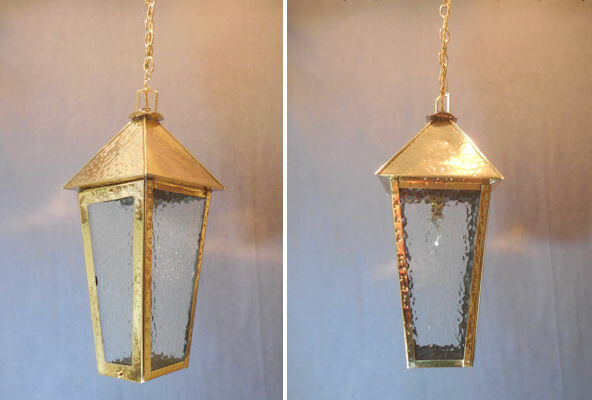 Original, quality 1920's brass lantern shaped brass electric hall lamp in an Art and Crafts style with a hammered decoration to the brass and fitted with similar replacement glass panels. This example is tall and square and tapered to the base with an overhanging hood to the top. One side panel will unscrew using two bolts to gain access to the bulb for changing. 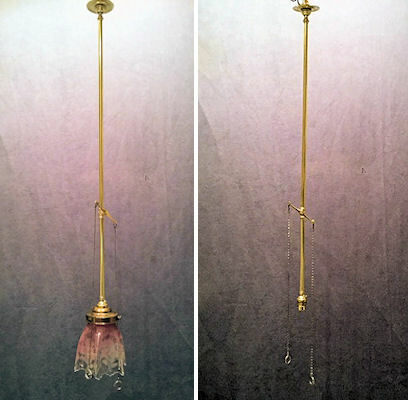 A length of replacement brass chain and the original brass ceiling rose is included, and all has been fully overhauled, polished and lacquered, although the lacquer may be removed at no extra cost and is complete and in good and working order. 19" tall plus chain plus rose 2.25" tall and rose 3.75" diam. 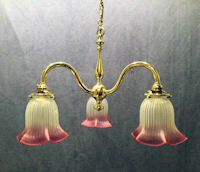 Set of three matching original, quality 1920's most unusual electric light fittings with frosted glass cylindrical shades, brass shade holders and frosted glass "Rings of Saturn". These superb lights have been rewired with modern three core silk covered flex and new brass UK bulb holders. 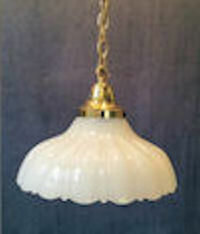 Fully overhauled and with replacement brass ceiling roses and lengths of brass chain are included. Polished and lacquered, although the lacquer may be removed at no extra cost and complete and in good and working order. The frosted glass rings are replacements made to suit copied from the chipped originals. These are the first we have seen of this model. Light 10.5" tall, plus 12" chain, plus 2" ceiling rose. Ring of Saturn 9.5". Cylinders 4.5" diam. Price is for the set. Click photo for larger and other views. Original, quality 1920's cast brass six branch electric light fitting. This most unusual example has a cast brass top rose with a concealed eye for hanging and six long tubular brass rods fitted to the six cast brass arms. All has been rewired with modern three core silk covered flex and new brass UK bulb holders. Has been polished and lacquered, although the lacquer may be removed at no extra cost, fully overhauled and complete and in good and working order. The drop can be shortened at no extra cost on request by shortening the six brass tubes. The contemporary shades are not included in the price but may well be available. All is complete and in good and working order. 34" drop excluding shades and 20" diam excluding shades. 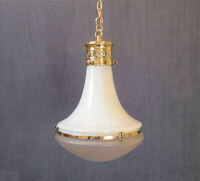 Original, quality 1920's white glass light fitting with the bowl suspended by three replacement brass chains and the original circular brass collar. 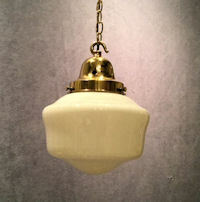 This light is supplied with an original brass ceiling rose with three hooks and a new wired brass bulbholder. Fully overhauled and the brass polished and lacquered, although the lacquer may be removed at no extra cost and complete and in good and working order. Bowl 14" diam and 7" tall. Total drop 20.5" plus 3" rose x 4" wide. 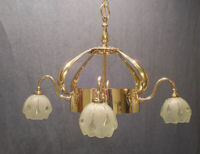 Original, quality 1920's four branch brass hanging electric light fitting in a serious Art Nouveau style. Has been rewired with modern three core flex and new brass UK bulb holders. The original brass ceiling rose, and a length of replacement brass chain is included although the shades are not included in the price, but these may be available; see our "Lamp Shades" section, item code S16. All has been fully overhauled, polished and lacquered, although the lacquer may be removed at no extra cost, and complete and in good and working order. 23" diam excluding shades. 17" tall excluding shades plus chain and rose 4" diam and 2.5" tall. Original, quality 1920's square brass electric hall lantern with a split domed top and a serious art nouveau design. Each side has a curved roof section with a pierced design and a glazed panel with an interwoven art nouveau design. 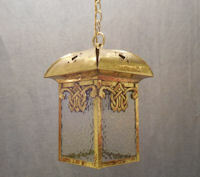 The top ring, and length of brass chain are replacements as are the textured glass panels. The ceiling rose is an old one. 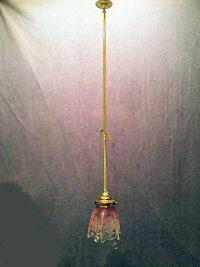 A most unusual lantern rewired with modern three core silk covered flex and a new brass UK bulb holder. Fully overhauled, polished and lacquered, although the lacquer may be removed at no extra cost and complete and in good and working order. 14" tall plus chain and ceiling rose 2.5" tall x 4" diam. Body 6" square and 8.5" widest at hood. Original, quality late 19th century, brass pendant gas light fitting converted to electricity with new three core flex and bulb holder to fit a standard UK electric bulb. The gas tap, as seen, is now fixed to permit the electric conversion and a replacement top brass disc and hook have been fitted. The shade is not included in the price, but may be available; see our "Lamp Shades" section, item code S45. All has been fully overhauled, polished and lacquered, although the lacquer may be removed at no extra cost. Complete and in good and working order. 24.5" tall, 4" widest and rose diam 2.75". Original, quality late 19th century, brass pendant gas light fittings converted to electricity with new brass bulb holder and three core flex to standard UK electric bulbs. The gas taps, as seen, are now fixed to permit the electric conversion and replacement top brass discs and hooks have been fitted. The shades are not included in the price, but may be available; see our "Lamp Shades" section, item code S44. All has been fully overhauled, polished and lacquered, although the lacquer may be removed at no extra cost. Complete and in good and working order. Excluding shade 20.5" tall, 5" widest and rose diam 2.75". 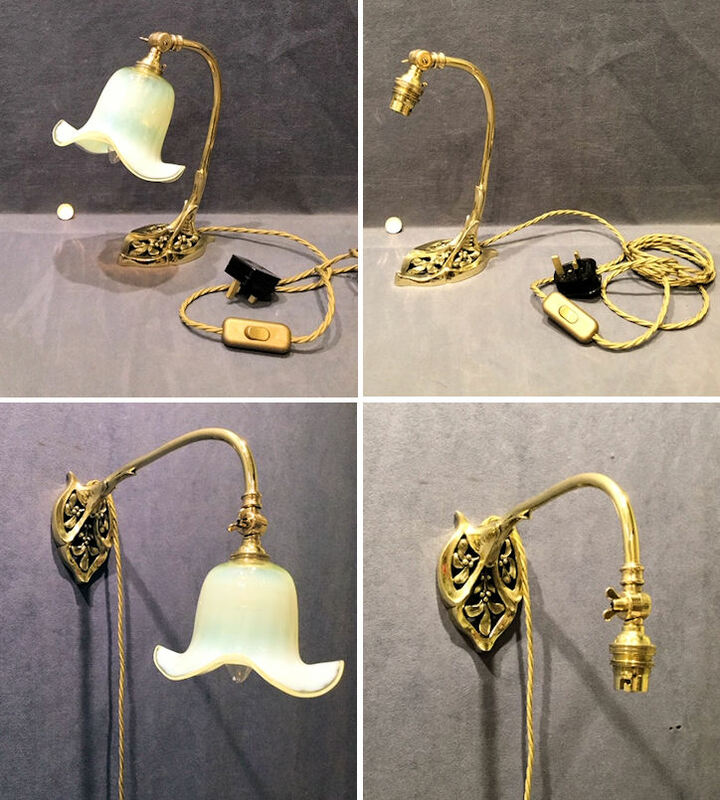 Original, quality 1920's, small frosted glass bowl, electric light fitting with a brass ring and replacement brass chains and ceiling rose. Has been rewired with modern three core silk covered flex and A new brass UK bulb holder. Fully overhauled and complete and in good and working order. 13" tall including chain, 6.25" widest and rose 2" tall and 2.5" diam. Original, quality 1920's small frosted glass bowl electric light fitting, with a nickel ring mount, replacement chromed chains and ceiling rose and has been rewired with modern three core silk covered flex and a new brass UK bulb holder. Fully overhauled and complete and in good and working order. 12" tall including chain, 8.5" widest and 2.5" rose. Price is for each. 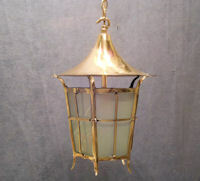 Original, quality 1920's Art Nouveau brass hall lantern with a tapered six sided body and with a coolie hat shaped roof. Replacement frosted, clear glass panels have been fitted, has been rewired with modern three core silk covered flex and a new brass UK bulb holder. A length of replacement chain is included, as is an old brass ceiling rose. The brass has been polished and lacquered, although the lacquer may be removed at no extra cost. Fully overhauled and complete and in good and working order. 14.5" tall x 10.5" widest, chain 15" long and rose 3" diam x 1.75" tall. 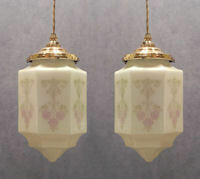 Pair of original, quality 1920's, electric pendant lamps with six sided, white glass, lantern shaped shades. 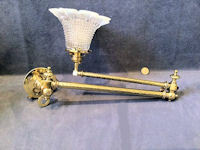 The original brass shade holders included, will fit standard, modern, UK electric bulb holders. This pair have been rewired with modern three core silk covered flex, new brass UK bulb holders, have olive fittings to the bulb holders and to the new brass ceiling roses. Each panel on the shade has a floral design of purple flowers and green foliage. The brass has been polished and lacquered, although the lacquer may be removed at no extra cost. Fully overhauled, complete and in good and working order. Shade and shade holder 11" x 5.5", 27" total length of flex and 2.5" ceiling rose diameter and 1.5" tall. 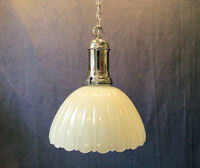 Original, quality 1920's, hanging electric light fitting with a white glass upper trumpet shape above a frosted glass bowl. The brass central band and top brass shade holder are both original and have been polished and lacquered, although the lacquer may be removed at no extra cost. A length of replacement brass chain and brass ceiling rose are included and all has been rewired with modern three core silk covered flex and a new brass UK bulb holder. Fully overhauled and complete and in good and working order. 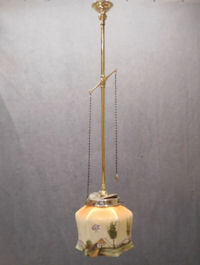 Light 13" tall x 8" diameter, plus 15" chain and ceiling rose 3" tall x 3.5" diameter. 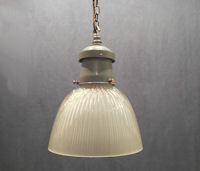 Original, quality, industrial electric pendant lamp with a cast iron fitting and the original 'holophane' multifaceted pressed glass shade marked for the manufacturer "Holophane" and "Patented 1909". This fitting has been rewired with modern three core silk covered flex utilising the original safe standard UK screw in bulb holder. The cast iron shade holder and the original cast aluminuim ceiling rose have both been cleaned and repainted in primer grey and a length of replacement bronze finish chain is included. Fully overhauled and complete and in good and working order. Light fitting 13" tall, bottom 9" diameter, ceiling rose 2.75" diameter and 2" tall, chain included 27". 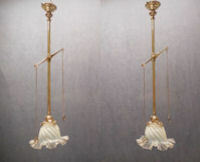 Pair of original, quality 1920's, hanging electric light fittings, with frosted spherical shades suspended within heavy cast brass shade holders. The main rings each have three large swags of laurel leaves laying over and down each globe beneath and above each has three curved supports up to the patent folding chain loop. 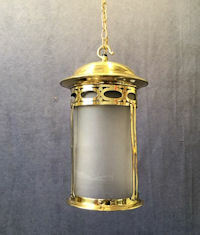 Each fitting has a 15" length of replacement brass chain and a matching cast brass ceiling rose. All has been rewired with modern three core silk covered flex and new brass UK bulb holders. Fully overhauled, polished and lacquered, although the lacquer may be removed at no extra cost. All is complete and in good and working order. 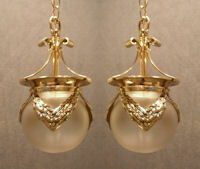 A wonderful pair of quality pendant lights. 12" drop, plus chain, plus rose, 8" widest, rose 3.25" diameter and 2" tall. 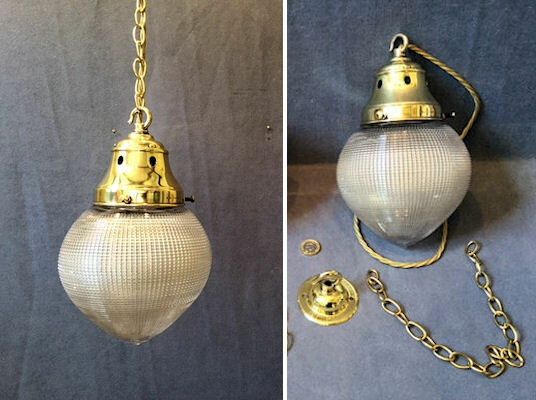 Original, quality 1930's, transfer decorated white glass hanging electric light globe, with the original large brass fitting and a replacement brass ceiling rose and length of chain. The floral decorations are in pastel colours and this light fitting has been rewired with modern three core silk covered flex and a new brass UK bulb holder. The brass has been polished and lacquered, although the lacquer may be removed at no extra cost and all is complete and in good and working order. A superb light fitting. 15" long plus chain and ceiling rose, 14" widest, 15" chain and 3.5" diameter ceiling rose x 2" tall. 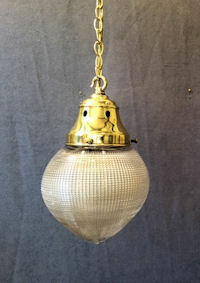 Original quality, 1920's, ceiling mounted electric light fitting with a white glass screw-in spherical shade and a brass ceiling mounted holder. Has been rewired with modern three core flex and a new UK brass bulb holder and has been polished and lacquered, although the lacquer may be removed at no extra cost. The shade holder is marked for the manufacturer 'Troughton & Young Ltd', 'Ultralux' and 'All British'. 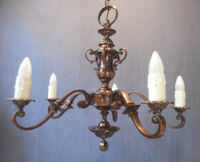 This light fitting was originally nickel plated which has now long gone and all is complete and in good working order. Shade 8" diameter, drop including holder 9.25". Original, quality 1920's chromed corinthian column side lamp, originally oil and now converted to electricity. This unusual example has a tapered reeded column on a square base decorated with embossed acanthus leaf and ribbing designs and a standard corinthian capitol to the top. Has been wired with modern three core silk covered flex, a new brass UK bulb holder, in-line switch and a three pin plug. Fully overhauled, polished and lacquered, although the lacquer may be removed at no extra cost. All is complete and in good and working order. The shade is for display only. 18.5" tall excluding shade and 6.25" square base. Original, quality circa 1900, brass corinthian column side lamp, originally oil and now converted to electricity. This example has a stepped square plinth at the base with laurel wreath decorations to each side, a reeded column and a good corinthian capitol. Has been wired with modern three core silk covered flex, a new brass UK bulb holder, in-line switch and a three pin plug. Fully overhauled, polished and lacquered, although the lacquer may be removed at no extra cost. All is complete and in good and working order. The shade is for display only. 18.5" tall excluding shade and 6" square base at floor. Click on photo for largre and other view. 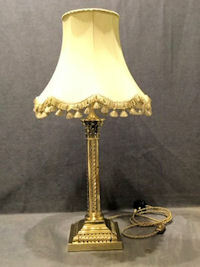 Original, quality circa 1900, brass corinthian column side lamp, originally oil and now converted to electricity. This example has a stepped square plinth at the base, a reeded column and a good corinthian capitol. Has been wired with modern three core silk covered flex, a new brass UK bulb holder, in-line switch and a three pin plug. Fully overhauled, polished and lacquered, although the lacquer may be removed at no extra cost. All is complete and in good and working order. The shade is for display only. 18.5" tall excluding shade and 5.75" square base at floor. 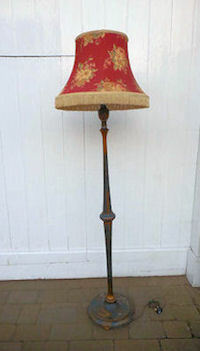 Original, quality late 19th century brass corinthian column side lamp of an unusual design. This super example was originally oil and has now been converted to electric. Has been wired with modern three core silk covered flex, a new brass UK bulb holder, in-line switch and a three pin plug. The column and plinth have diagonal ribbed decoration and the plinth has a registration number for the year 1895. Fully overhauled, polished and lacquered, although the lacquer may be removed at no extra cost and complete and in good and working order. 20.5" tall and base 6.5" square. 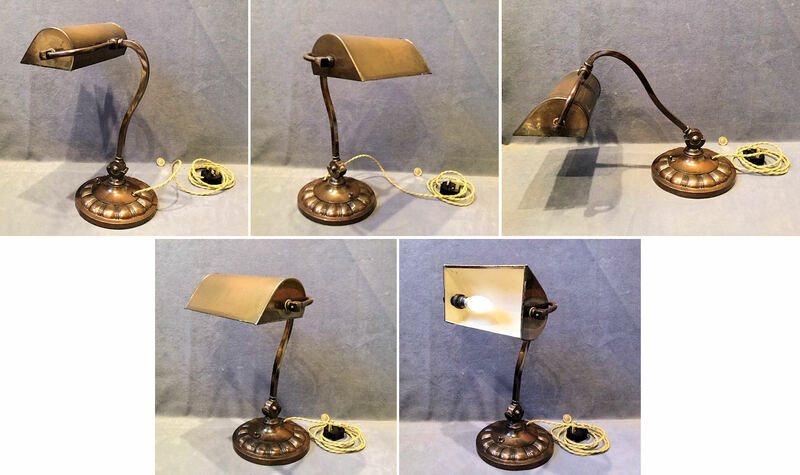 Original, quality 1920's brass electric desk / reading lamp in the original bronze finish. This super example has a circular weighted base with an embossed detail, a square tube stem and shade holder and the original trough shade. Has been rewired with modern three core silk covered flex, a new brass UK bulb holder and a three pin plug. Fully overhauled and complete and in good and working order. Base 8" diam, shade 8.75" x 4.75" x 2.75", total height 15.75" and 11" widest. Can be polished back to the shiny brass for no extra charge if required. 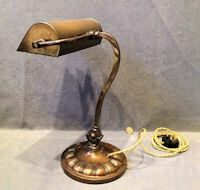 Original, quality 1920's cast brass electric desk / reading lamp with the facility for alternative use as a wall light. 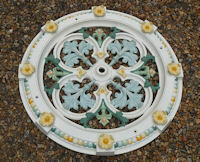 This Art Nouveau example has a pierced and decorated base, an arched over arm and a swivel joint for the bulb holder. Has been rewired with modern three core silk covered flex, a new brass UK bulb holder, in-line switch and a three pin plug. Fully overhauled, polished and lacquered, although the lacquer may be removed at no extra cost and complete and in good and working order. Base 5.5" x 3.75" and total 10.5" tall as desk lamp. The shade is not included in the price, but may be available; see our "Lamp Shades" section, item code S221. 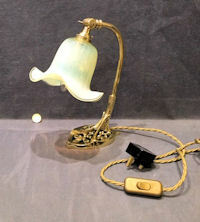 Original, quality 1920's cast brass electric desk / reading lamp with the facility for alternative use as a wall light. This Arts and Crafts example has a shaped base, an arched over arm and a swivel joint for the bulb holder. Rewired with modern three core silk covered flex, a new brass UK bulb holder, in-line switch and a three pin plug. Fully overhauled, polished and lacquered, although the lacquer may be removed at no extra cost and complete and in good and working order. The shade is not included in the price, but may be available; see our "Lamp Shades" section, item code: S222. 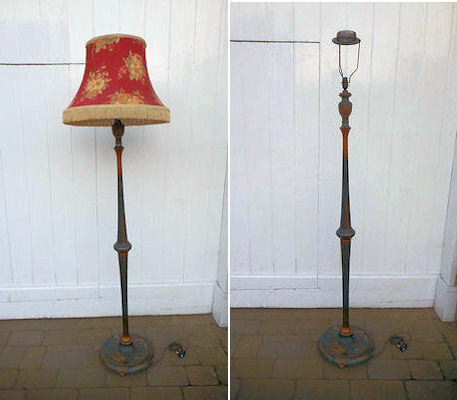 A very stylish lamp. As desk lamp 17" tall, base 5.5" wide x 7" front to back. Original, quality 1920's wooden electric standard lamp finished in a lacquered chinoiserie design with a tapered stem and a circular base. The decorative chinoiserie finish is rubbed in places and has some missing here and there, but overall this lamp is generally in good condition, most unusual and complete and in good and working order. Excluding shade fixed height 65" and base 14" diam. The shade is for display only. 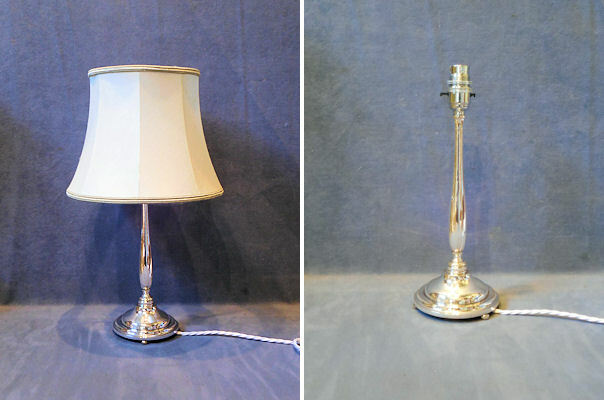 Original, quality 1920's nickel plated on brass electric side light, with a shaped stem on a circular base with three bun feet. Has been rewired with modern three core silk covered flex, new brass UK bulb holder, switch and a three pin plug. Fully overhauled, polished and lacquered, although the lacquer may be removed at no extra cost. Complete and in good and working order. The shade is for display only 12.5" tall and 4.5" diam base. 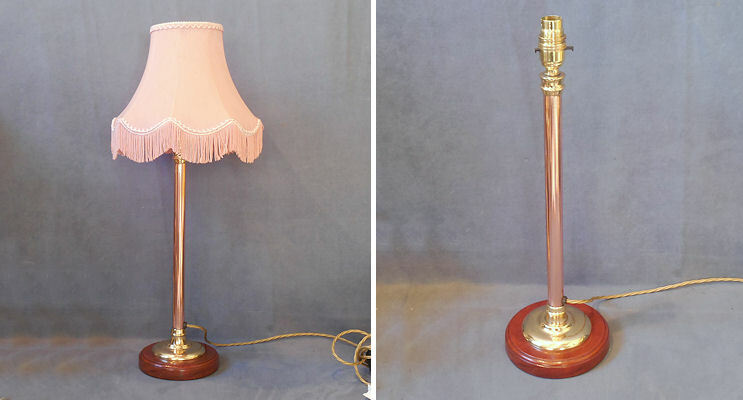 Original, quality 1920's, electric side lamp with a copper column on a cast brass base all on a circular mahogany plinth, weighted to the underside for balance. This example has been rewired with modern three core silk covered flex, a new brass UK bulb holder, switch and a three pin plug. This plain example is most unusual, has been fully overhauled and is polished and lacquered, complete and in good and working order. 18.5" tall excluding shade x 6" base diameter.The shade is for display only. 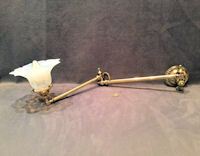 Original, quality 1920's, cast brass very decorative continental, combination electric reading / side lamp or wall light. 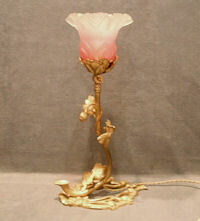 This example, in the original matt gilt finish, has a serious Art Nouveau form of poppy stem, leaves, and seed pods. As a side / reading lamp the shade and bulb can be an uplighter or angled to one side and as a wall light again uplighter or down. 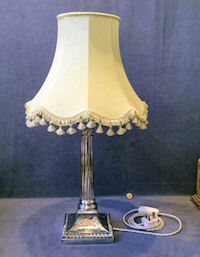 A most unusual and extraodinary lamp, the first we have seen. Has been rewired with modern three core silk covered flex, a new brass UK bulb holder, switch and a three pin plug. Fully overhauled, polished and lacquered, although the lacquer may be removed at no extra cost. Complete and in good and working order. 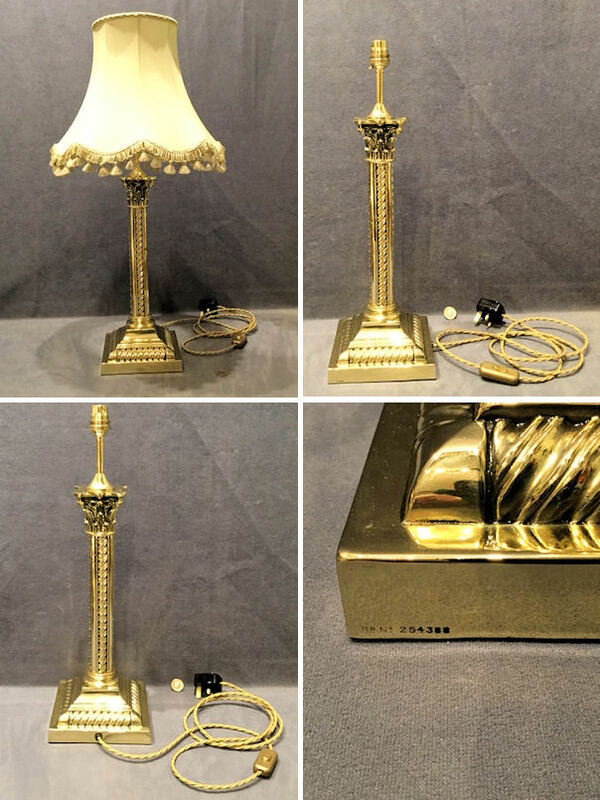 As table lamp excluding shade 14" tall x 9" and 6.5", as wall light excluding shade 9" tall x 6.5" and 14" front to back.The shade is not included in the price, but may be available; see our "Lamp Shades" section. 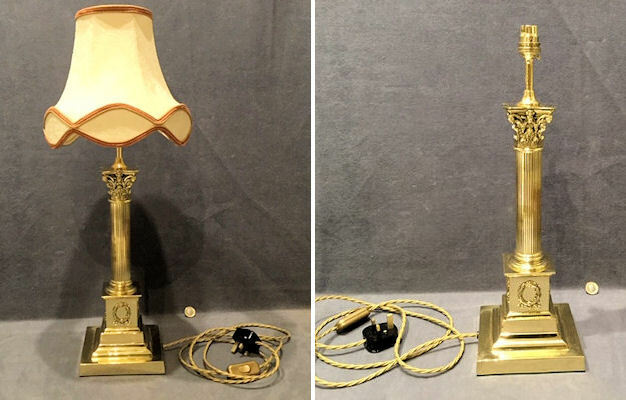 Original, quality 1920's, brass electric side / wall lamp, rewired with modern three core silk covered flex, new brass switch, UK bulb holder and a three pin plug. 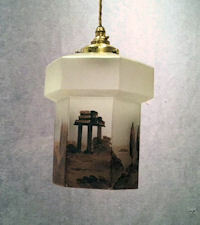 This example was designed for optional use either as a side lamp or wall light in the guest bedroom. When used as a wall light the curved design to the rear foot can be hooked over a nail or a picture rail and the bulb holder swivel joint would enable the bulb to face either up or down. The reverse is impressed "British B & L" for the maker and with a trade logo mark. Polished and lacquered, although the lacquer may be removed at no extra cost. Complete and in good and working order. Backplate/base 10.5" x 8.25" widest and 2" front to back, total height 13.5" as side lamp, 10.5" tall and 13.5" front to back as wall light. 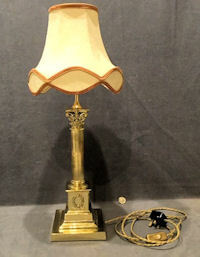 Original, quality, 1920's, taller than average, cast brass, electric side lamp with a circular weighted base and a turned column. Has been rewired with a modern three core silk covered flex, a new UK brass bulb holder, switch and a three pin plug. All has been fully overhauled, polished and lacquered and is complete and in good and working order. The lacquer can be removed upon request, at no extra cost and the shade is for display only. Base 6.5" diameter and 18.25" tall excluding shade. 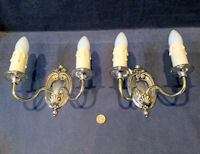 Original, quality pair of 1920's nickel plated electric wall lights simulating wall candle sconces. Rewired with modern three core silk covered flex, new chromed UK bulb holders and replacement card candle look-a-likes fitted to cover the bulb holders. The oval shaped backplates have shell shaped decoration and thin stems supporting the 'Candle' fitting. Fully overhauled, polished and lacquered, although the lacquer may be removed at no extra cost and complete and in good and working order. Backplate 6.5" x 3.25", total 9" tall including bulbs, 8.5" widest and front to back 4.75". Original, quality late 19th century, copper exterior wall light, originally gas and now fitted with an electric bulb holder and stem which can be wired with exterior cable on request for no extra charge within reason. This example has a white enamel sheet to the back and a steel panel behind, a hinged door to the front and four mounting brackets. All has been re-glazed and the copper has been left in the old weathered colour. All is complete and in good order. 21" tall, top 15" wide and 11" front to back. Base 10.5" wide and 7" front to back. Original, quality late 19th century brass wall mounted gas bracket converted to electricity. Has been wired with modern three core silk covered flex and a new brass UK bulb holder. This unusual example has an extending arm with two lengths of brass tube with a swivel joint near the circular backplate and another halfway between the two lengths. The circular cast brass backplate has some impressed decoration and the original gas tap has been retained, although the wiring has bypassed this. 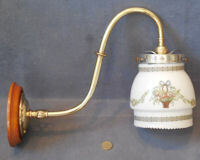 Although originally mounted as an uplighter, it could now be used both up or down. All has been fully overhauled, polished and lacquered, although the lacquer may be removed at no extra cost and is complete and in good and working order. The shade is not included in the price, but may be available; see our "Lamp Shades" section, item code S155. Backplate 3.75" diam, total height 7". Length of arm closed 13" and 22.5" when extended. 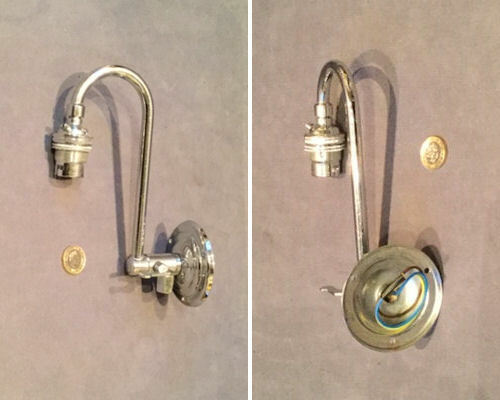 Original, quality 1940's small chrome on brass gas wall bracket converted to electricity. Has been wired with modern three core flex and a new UK bulb holder. Polished and lacquered, although the lacquer may be removed at no extra cost and complete and in good and working order. Backplate 2.75" diam, total 8" tall and 5" front to back. Pair of original, quality 1920's/30's plain brass electric wall light fitted with a modern brass knuckle joint, adjustable with a wingnut. Have been rewired with modern three core silk covered flex and a new brass UK bulb holder. These fittings can be used as an uplight or down. Polished and lacquered, although the lacquer may be removed at no extra cost. Fully overhauled and complete and in good and working order. Backplate 3.25" diam, total 7" tall and 11" front to back. Price is for the pair. 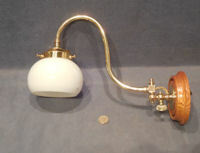 Original, quality late 19th century brass, gas swivel wall light converted to electricity. Has been wired with modern three core flex and a new brass UK bulb holder and fitted with a light oak circular backplate made to suit. Although originally mounted as a down lighter, it could now be used both up or down. The shade is not included in the price, but may be available; see our "Lamp Shades" section, item code S51. All has been polished and lacquered, although the lacquered may be removed at no extra cost. All is complete and in good and working order. 10.5" tall and 11" front to back when out, 3" front to back against wall excluding shade and 4" diam of wooden backplate. Original, quality late 19th century brass, gas swivel wall light converted to electricity. Has been wired with modern three core flex and a new brass UK bulb holder and fitted with a light oak circular backplate made to suit. Although originally mounted as down lighter, it could now be used both up or down. The shade is not included in the price, but may be available; see our "Lamp Shades" section, item code S558. All has been polished and lacquered, although the lacquered may be removed and no extra cost. All is complete and in good and working order. 12" tall and 12" front to back when out. 3" front to back against wall excluding shade and 5" diam wooden backplate. 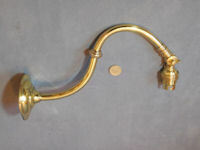 Original, quality late 19th century brass, gas swivel wall light converted to electricity. Has been wired with modern three core flex and new brass UK bulb holder and fitted with a light oak circular backplate made to suit. Although originally mounted as a down lighter, it could now be used both up or down. The shade is not included in the price, but may be available; see our "Lamp Shades" section, item code S977. The brass backplate is stamped "GL&C Co" for the gas light and coal company. All has been polished and lacquered, although the lacquered may be removed at no extra cost. All is complete and in good and working order. 13" tall and 11.5" front to back when out. 3.5" front to back against wall excluding shade and 5" diam wooden backplate. Original, quality late 19th century brass, gas swivel wall light converted to electricity. Has been wired with modern three core flex and a new brass UK bulb holder and fitted with a light oak circular backplate made to suit. Although originally mounted as a down lighter, it could now be used both up or down. The shade is not included in the price, but may be available; see our "Lamp Shades" section, item code S913. All has been polished and lacquered, although the lacquered may be removed at no extra cost. All is complete and in good and working order. 12.5" tall and 11" front to back when out, 3.5" front to back against wall excluding shade and 5" diam backplate. Original, quality late 19th century brass, gas swivel wall light converted to electricity. Has been wired with modern three core flex and a new brass UK bulb holder and fitted with a light oak circular backplate made to suit. Although originally mounted as a down lighter, it could now be used both up or down. The shade is not included in the price, but may be available; see our "Lamp Shades" section, item code S11. All has been polished and lacquered, although the lacquered may be removed at no extra cost. All is complete and in good and working order. 14" tall and 12" front to back when out, 3.5" front to back against wall excluding shade and 5" diam oak backplate. 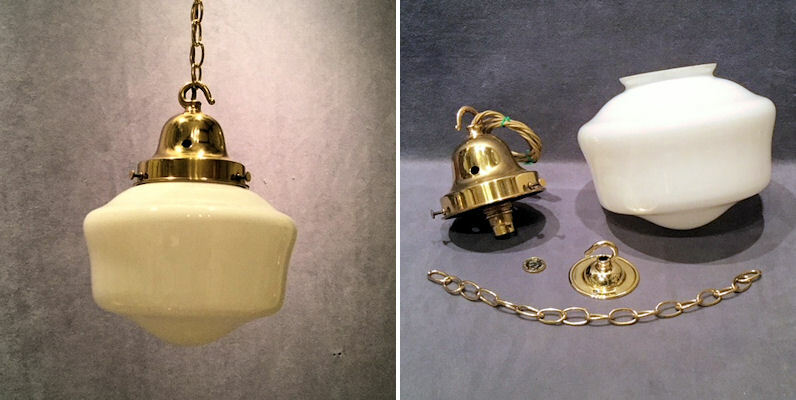 Original, quality late 19th century brass, gas swivel wall light converted to electricity. Has been wired with modern three core flex and a new brass UK bulb holder and fitted with a mahogany circular backplate made to suit. Although originally mounted as a down lighter, it could now be used both up or down. The shade is not included in the price, but may be available; see our "Lamp Shades" section, item code S49. All has been polished and lacquered, although the lacquered may be removed at no extra cost. All is complete and in good and working order. 12" tall and 11" front to back when out, 4" front to back against wall excluding shade and 4.5" diam mahogany backplate. Pair of original, 1920's quality cast brass three branch candle wall scovies of the Dutch design. This super pair of wall brackets have a bulbous mount to the backplate, with a shaped stem and a hanging ring to the top. Each of the brackets have shaped arms with a candle holder and a drip pan and all can be lifted out for ease of candle replacement, for each arm is fitted with a removable peg. Polished and lacquered, although the lacquer may be removed at no extra cost and all is complete and in good and working order. 15" tall, 16.5" wide and 9.75" front to back. Original, quality late 19th century brass, gas wall light converted to electricity has been wired with modern three core flex and a new brass UK bulb holder and fitted with a replacement mahogany circular backplate made to suit. The gas tap, as seen, is now fixed to permit the electric conversion. Although originally mounted as a down lighter, this can now be used both up or down. The shade is not included in the price, but may be available; see our "Lamp Shades" section, item code S605 All has been polished and lacquered, although the lacquered may be removed at no extra cost. All is complete and in good and working order. 10" tall, 11" front to back exclude shade, wood backplate 4.5" diam and brass backplate 2.5" diam. 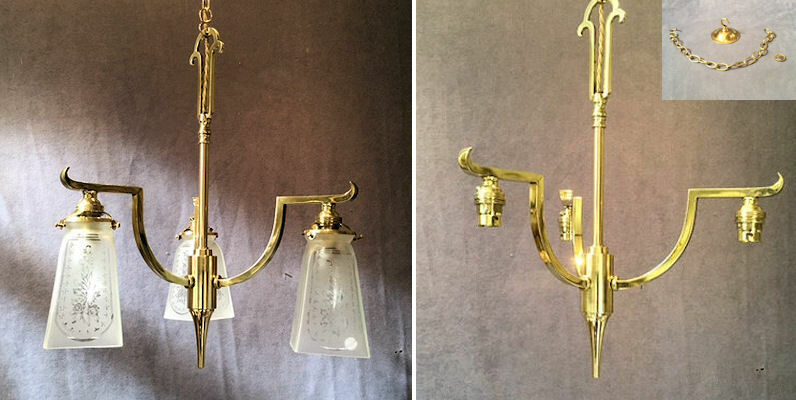 Original, quality late 19th century brass, gas wall light converted to electricity. Has been wired with modern three core flex and a new brass UK bulb holder and fitted with a replacement honey coloured oak circular backplate made to suit. The gas tap, as seen, is now fixed to permit the electric conversion. Although originally mounted as a down lighter, this can now be used both up or down. The shade is not included in the price, but may be available; see our "Lamp Shades" section, item code S936 All has been polished and lacquered, although the lacquer may be removed at no extra cost. All is complete and in good and working order. 11.5" tall, 12.5 front to back excluding shade. Wood backplate 5" diam and brass backplate 3.25" diam. 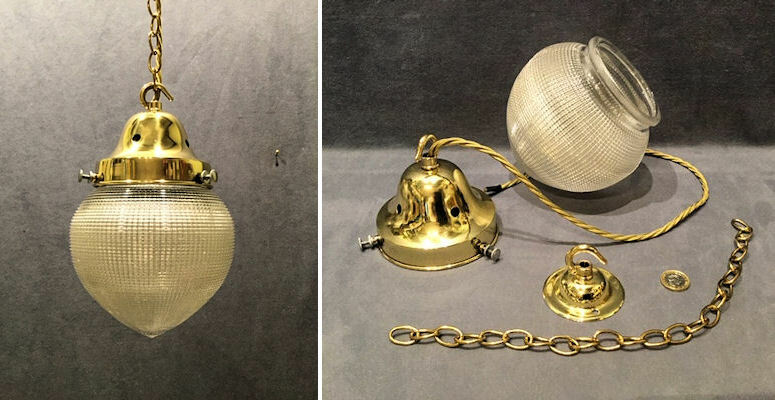 Original, quality 1920's, brass electric wall light of a simple form with a decorative circular brass backplate, with three screw holes for mounting. This is suitable for both up or down lighters and has been rewired with modern three core silk covered flex and new brass UK bulb holder. Fully overhauled, polished and lacquered, although the lacquer may be removed at no extra cost and is complete and in good and working order. Backplate 3.75" diameter, total height 8" x 10.5" front to back. Price is for each.The shade is not included in the price and is no longer available. Original, quality, late 19th century, extending brass wall mounted gas bracket, now converted to electricity. This most unusual example has a two section brass arm, with two swivel points so it can be used at a short length or extended fully out. The backplate is plain and circular, with three countersunk screw holes for mounting and the double tube has a continuous decorative pattern. Has been wired with modern three core flex and a new brass UK bulb holder and the gas tap, as seen, is now fixed to permit the electric conversion. Although originally mounted as an uplighter, it could be used both up or down. Fully overhauled, polished and lacquered, although the lacquer may be removed at no extra cost. Backplate 3.5", flat against wall 14.5" wide, and 4" front to back, extended fully 26.5". The shade is not included in the price, but may well be available ref code: S236. Original, quality 1920's, brass gas wall bracket converted to electricity and fitted with a replacement walnut backplate, but can be mounted with or without the wooden backplate. Wired with modern three core flex, a new brass UK bulb holder and to fit a standard, modern, UK electric bulb. The gas tap, as seen, is now fixed to permit the electric conversion. Fully overhauled, polished and lacquered, although the lacquer may be removed at no extra cost. Complete and in good and working order. Wooden backplate 5.25" diameter, brass backplate 3" diameter, total 10.5" tall and 13" front to back excluding shade. The shade is not included in the price, and is no longer available. Original quality, late 19th century, brass swivel gas wall bracket now converted to electricity. This S shaped bracket has applied leaf and flower decoration, which is followed through on the gas tap and the backplate. The gas tap is now fixed to permit the electric conversion and although, originally, mounted as up lighter, this could now be used either up or down. 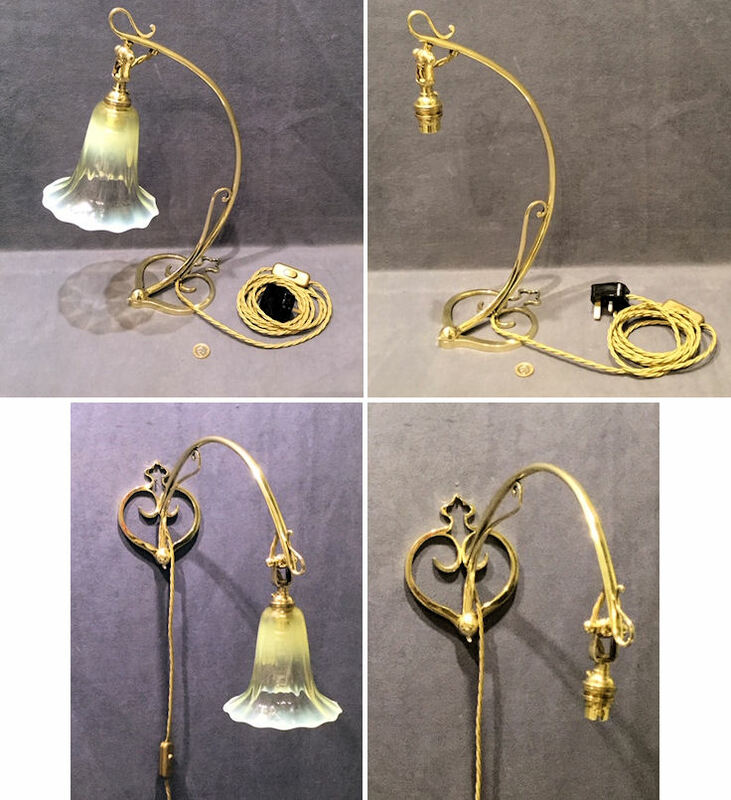 Has been wired with modern three core silk covered flex and new UK brass bulb holder, has been fully tested and lacquered and is now complete and in good and working order. Backplate 4" diameter, 8.25" high and 15." front to back when out, excluding shade. The shade is not included in the price and is no longer available. 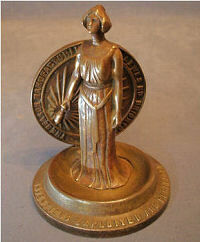 Original, quality, 1920's brass figure advertising "The Reason Manufacturing Co Ltd of Lewis Road, Brighton". The female figure dressed in a toga style of outfit is holding what could be an early 'Ediswan' type pointed electric light bulb and stands on a circular plinth, before a large circular disc, perhaps simulating to a large gong? This gong is detailed to the front for "The Reason Manufacturing Co Ltd of Lewis Road, Brighton " and to the reverse "Electrolytic Meters, Prepayment Meters and Midget Meters, Arc Lamps, Fireboxes, Demand Indicators, Time Switches and Street Lighting Fittings." The circular plinth is also detailed "Inventions exploited and perfected". An unusual item, the first we have seen and all in the old bronzed finish. Complete and in good order. Plinth 3.75", rear disc 3.25", height 5.25". Original, quality, late 19th century, very decorative large cast iron ceiling rose, with great detail in relief of acanthus leaves and flowers. The front has been painted in a variety of colours to highlight the detail, but could be repainted of course and the reverse has a registration lozenge mark for the years 1842 - 1883. This item has four countersunk screw holes for mounting. 30.5" x 2.5" front to back and a centre hole 1.25" diameter. 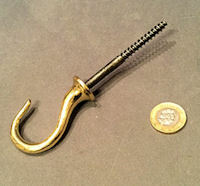 Original, quality late 19th century brass chandelier hook with a long steel wood screw thread. Polished and lacquered, although the lacquer may be removed at no extra cost and complete and in good and working order. 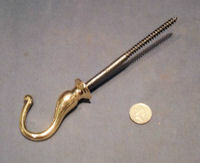 Total 5.5" long + 1.5" wide, steel thread 3" and brass hook 2.5". Original, quality late 19th century, brass chandelier hook of a good shape with a tapered threaded steel woodscrew stem for mounting. This example also has the originally pressed brass backplate and all is complete and in good and working order. Polished and lacquered, although the lacquer may be removed at no extra cost. Hook 1.5" x 2.25" wide and thread 3.5". Total length 6" and backplate 2" diam. 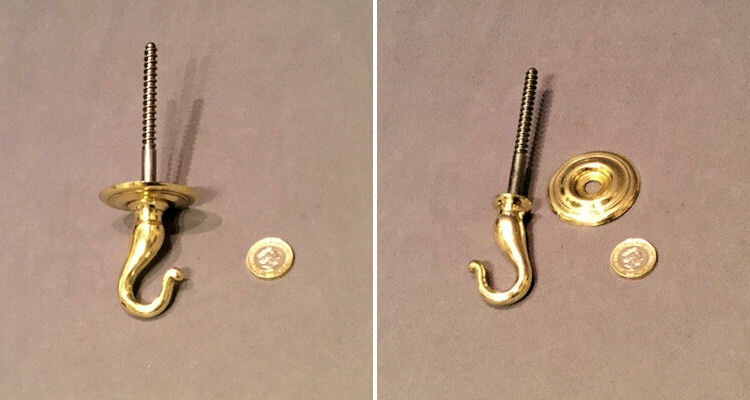 Original, quality, late 19th century, brass chandelier hook of a good shape with a tapered threaded steel woodscrew stem for mounting. The brass has been polished and lacquered, although the lacquer may be removed at no extra cost. Complete and in good and working order. Hook 3" x 2" wide and thread 5" total 8".